Hayes & Yeading United closed pre-season with a confidence boosting victory at Arlesey Town and now the real test begins with the first league game at home to Bromley next week. 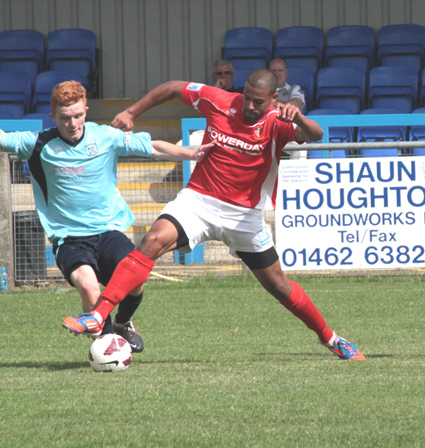 It was a competitive match for a friendly in the warm Bedfordshire sunshine with plenty of incident throughout. Early on, Jake Reid charged down a clearance from home keeper Nathan Abbey but in attempting to tee up a team mate in the middle, he hit his pass just behind both Luke Williams and Kamaron English. Both teams exchanged long range shots which were of little danger before Louie Soares hit a rising shot just over from Dominic Vose’s lay off. Williams then crossed for Reid at the near post but he couldn’t quite get his foot around the ball to direct it on target. A couple of dangerous free kicks swept across United’s goalmouth and Mikhail Jaimez-Ruiz gathered in a couple of well hit daisy cutters, but just as it seemed that the home side were creating some pressure, an under hit back pass let Reid in behind the defence and he rolled the ball past Abbey and into the net (above). Williams was the orchestrator of most of United’s promising approach play, but it was his shot which went close next, coming back off the bar after good work from English on the left. Reid’s follow up shot was charged down. Just before half time, the hosts were level as Hayles received the ball in the penalty area and got in behind Dean Inman, whose desperate lunge caught the veteran striker. 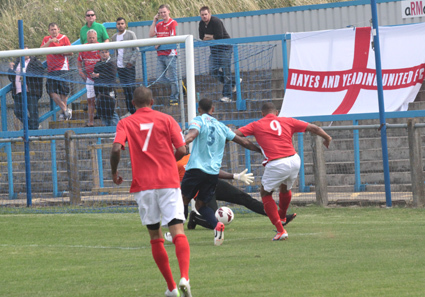 Hayles picked himself up to convert the penalty into the top corner. United made an assertive start to the second half as Reid cut the ball back to Williams who placed the ball just wide of the post. Then English had a shot blocked and Vose tried to steer the loose ball in at the far post, narrowly placing it the wrong side. United were in control at this point and Inman headed inches wide from an accurate cross by substitute Tom Bird. Then Williams fired just wide from another Reid pass. Arlesey almost scored again when a long shot deflected off Charlie Wassmer and spun just wide and the same player shot just over soon afterwards. However, with 12 minutes remaining, Reid played a square pass to Soares who dipped the shoulder to create space before lofting the ball into the top corner from the edge of the box. Williams almost got a deserved goal towards the end but his cross shot free kick was diverted wide by a home defender. It wasn’t to matter though as victory was confirmed on a good day for United, although injuries to Inman and Soares may well give manager Phil Babb some decisions to make in the final week before the new season.